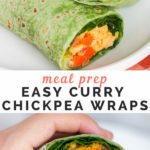 These flavorful curry chickpea wraps are made in under ten minutes, making them perfect for vegetarian meal prep or a quick lunch. Last week I shared a recipe for Vegan Quinoa Taco Salad, the first installment in my Meal Prep Monday series. 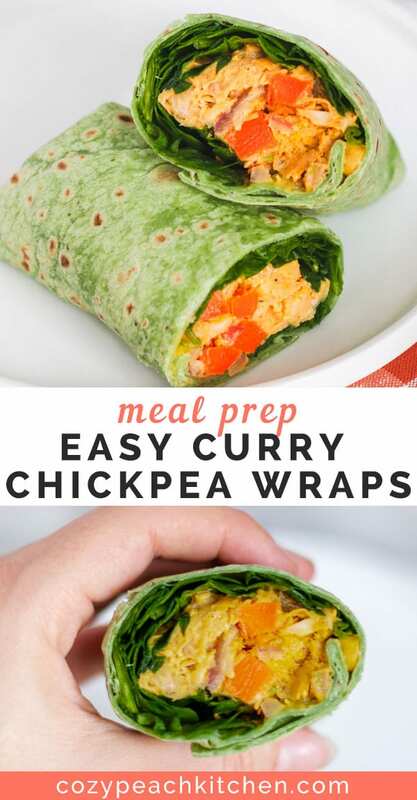 Week 2 is for Curry Chickpea Wraps, an easy 10 minute vegetarian meal prep recipe! Chickpea salad with garam masala is a flavorful twist on a meal prep staple. I’ve had a lot of conversations with friends about their lunch and meal prep habits (file under “life of a dietitian”) and the most common meal prep recipe I hear about is chickpea salad sandwiches. Well, this is not my first chickpea salad rodeo; check out this Chickpea Avocado Salad or the classic Chickpea Salad Sandwich. 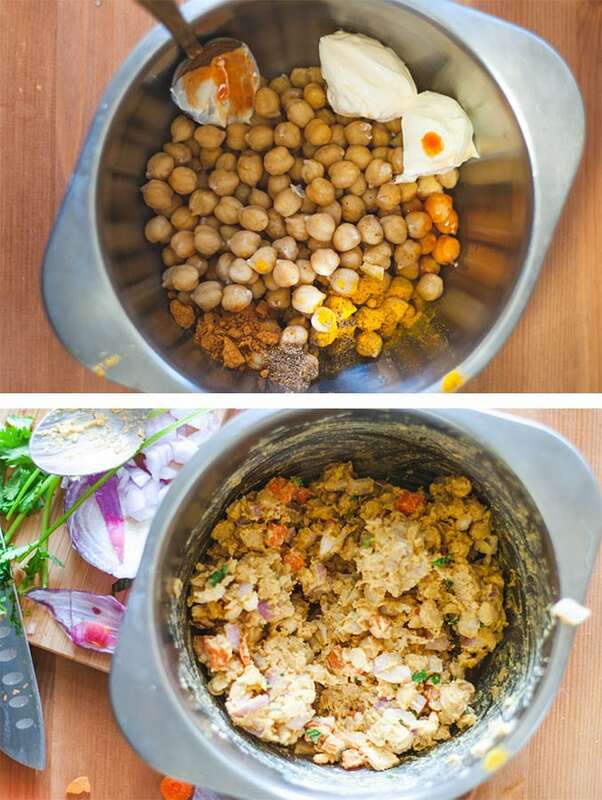 It’s so easy to mash up a can or two of chickpeas, mix them with a creamy sauce like tahini or mayo, and season to perfection with your favorite spices. In this case, we’re seasoning with garam masala, turmeric, lime and cilantro. 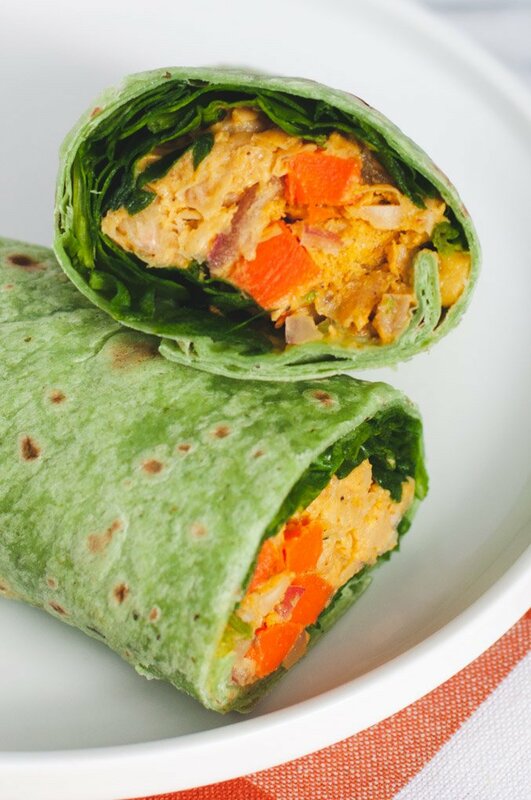 Throw in some carrot and red onion for a bit of crunch and top with fresh spinach, maybe a bit of hot sauce, and a handful of chopped cashews. What is garam masala made of? Garam masala is a blend of ground spices used in Indian cuisine. “Garam” refers to heat and “masala” means spice, literally meaning “hot spices”. While garam masala mixtures vary regionally and by family, the most common blends found in US supermarkets are made with coriander, cumin, cloves, cardamom, black pepper, cinnamon, and nutmeg. Learn more about garam masala or make your own garam masala. A well rounded vegetarian lunch should be filling enough to last you until your next meal. You can make a filling lunch by choosing complex carbohydrates and protein and fiber packed ingredients like the ones used in this chickpea salad recipe. Chickpeas, also known as garbanzo beans, are a good source of plant based protein and fiber. Among many other benefits, fiber and protein work together to increase our satiety, or our feeling of fullness. Spinach is a nutrient powerhouse that is rich in both water and fat soluble vitamins, minerals, and phytonutrients. 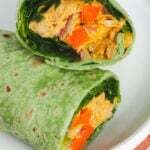 Use a hearty handful of spinach in your curry chickpea wrap for increased satiety. 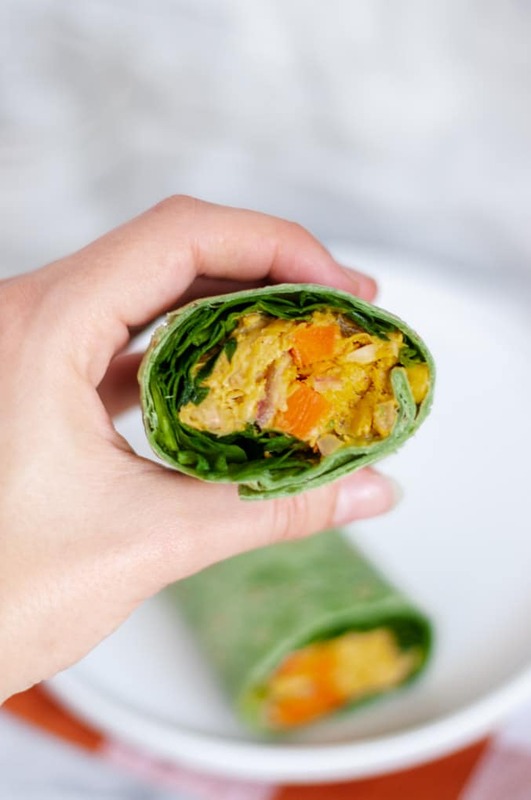 Whole wheat flour tortillas supply this wrap recipe with added nutrients and fiber. Choose a tortilla with whole wheat as the first ingredient on the label. If you aren’t a fan of whole wheat tortillas you can choose a spinach or white tortilla. Looking to stretch this recipe further? 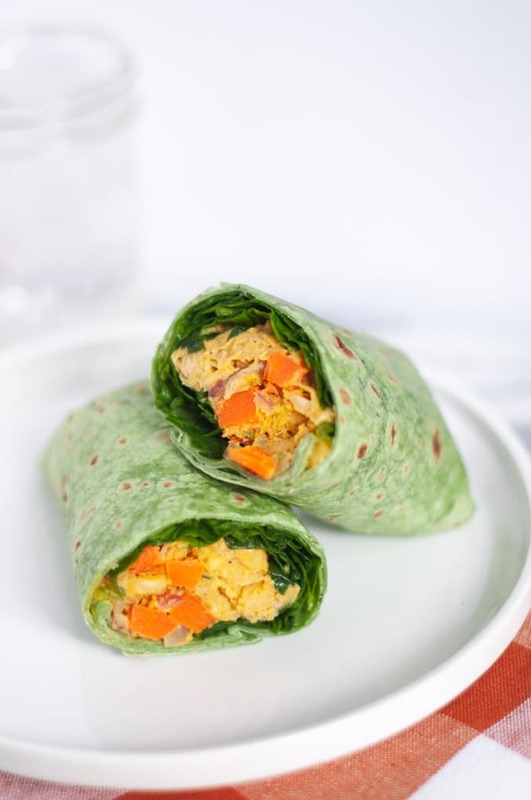 Enjoy this veggie packed curry chickpea wrap with a serving of your favorite fruit and rest easy knowing that you have lunch prepared for the entire week. 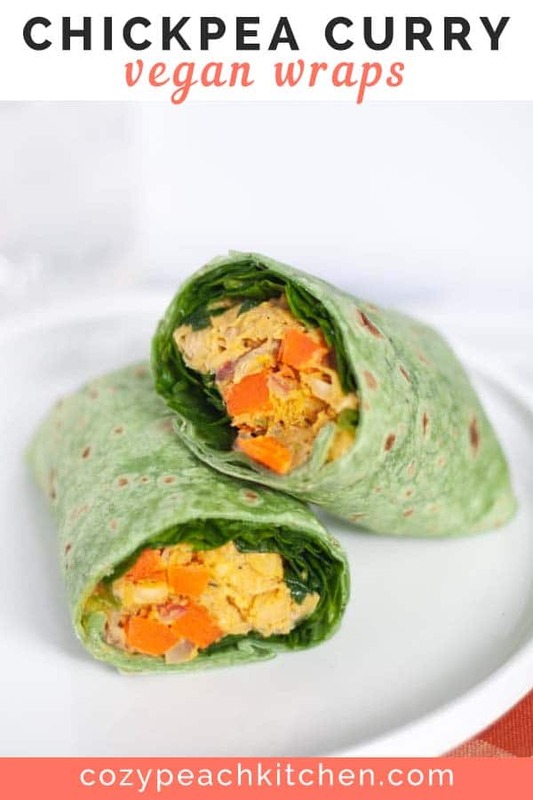 Flavorful vegetarian chickpea wraps filled with garam masala and spinach. Perfect for meal prep or a quick lunch. Rinse and drain can of chickpeas. Pat dry with a paper towel or clean towel to remove excess moisture. Combine chickpeas, mayonnaise, and seasonings in a medium mixing bowl. Use a fork to mash the chickpeas; make as chunky or as smooth as you prefer. Add the remaining ingredients to the chickpeas. Stir to combine. Taste for seasonings. Place 1/2 cup of spinach in the center of a 9" tortilla. Cover with 1/2 cup of curry chickpea salad. Layer with additional toppings, like tomato or avocado. Fold in the edges and roll into a burrito. Enjoy!